WE HAVE LARGE STOCKS OF ALL THESE UNITS. 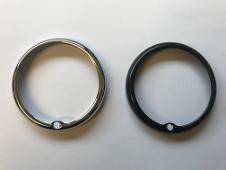 Available in chrome, black enamel or black enamel with chrome rim. Glass lens. for stop/tail or stop/tail & flasher. LB2 gives stop/tail and number plate. LB5 gives you amber flashing indicators when used with our red/amber conversion lens (STFL1). LB6 gives you red flashing indicators. Available in chrome or black enamel with early type glass split lens or late type full lens. 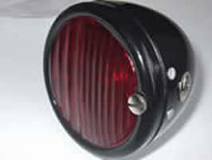 Excellent quality reproduction Lucas L549 stop/tail lamp with red reflector. Fits on a sloping rear wing - Rubber mounting pad included. Ideal retro fit on many pre war cars. Fits original and repro lamps. Sold singly or in pairs. 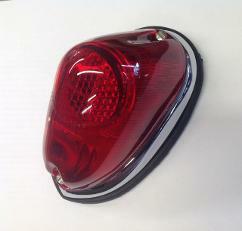 Replacement black enamel and chrome rims for Lucas ST38 lamps. 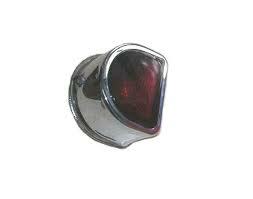 Replacement clear number plate lens for Lucas ST51 lamps.